At a second web site, the subject is: The Histopathology of Inflammation. The approach is philisophical. Navigation aids in yellow cluster (above) will allow the reader to move among, or along, tiers. Presented and discussed by Richard J. Reed, M.D. Note: There are two Section Diagrams: Section Diagram 2, and Section Diagram 1. 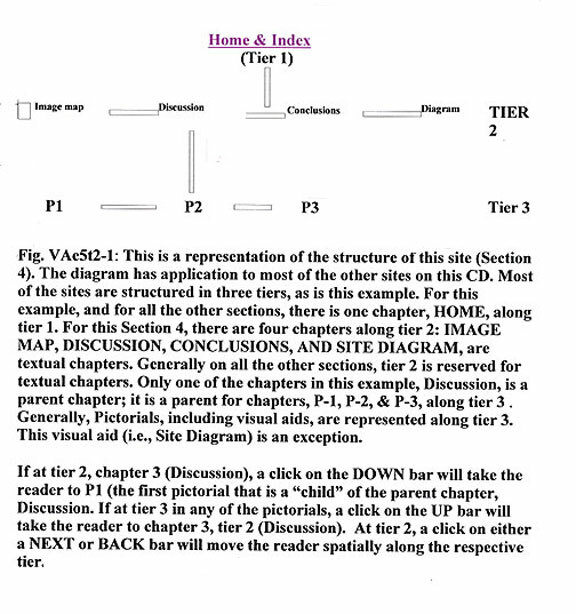 This site is structure in two tiers with only a single chapter on each tier. The aids to navigation are the same as those for all the other sections. This HIV+ man presented with an extensive, generalized rash involving not only the skin but also the oral mucosa. The facial lesions were numerous and some were confluent. Some of the lesions had molluscum contagiosum-like qualities. The molluscum contagiosum-like quality of many of the skin lesions in this patient is a feature encountered in some examples of AIDS related deep fungus infections. Perhaps it is more commonly associated with AIDS related cryptococcus. The liver and spleen were not found to be enlarged. 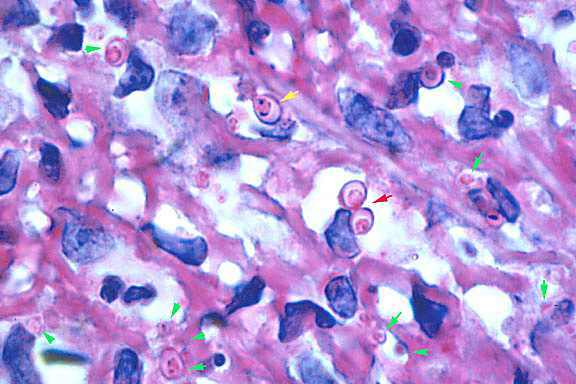 Generally, they are palpable in disseminated histoplasmosis but in HIV+ patients, the clinical findings may be altered and hepatosplenomegaly may not be a feature. Fig. 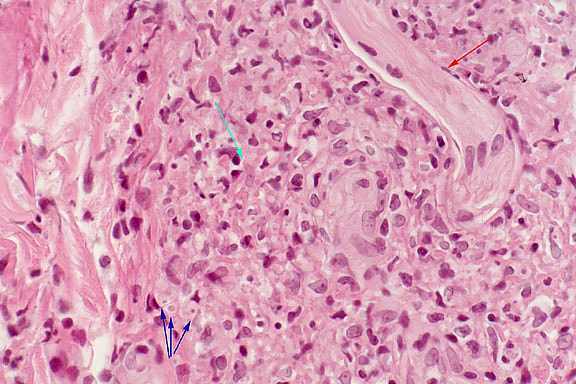 2: Lesions are hyperkeratotic and confluent. Some have a molluscum contagiosum-like quality. The granulomas in the skin lesions from this patient are poorly organized. Perhaps this too is a feature related to the altered immunity associated with HIV infection. 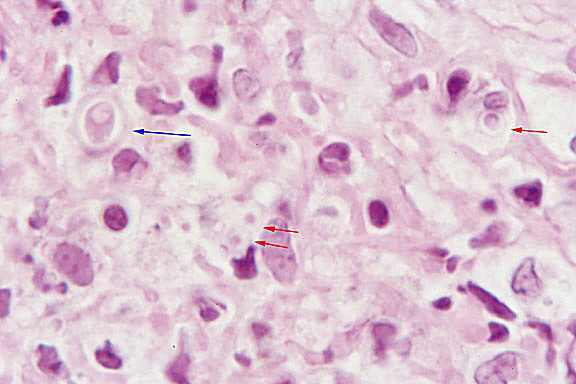 It is of interest that many of the histiocytes in the infiltrates are of the migratory type and are not activated (morphologically activated to form tubercle-like aggregates of “epithelioid” cells). The infiltrates generally are poor in lymphocytes. There is variation in the size of organisms. Organisms are numerous but some are so small they are difficult to identify with “dry” objectives. Fig 3: Infiltrates in the dermis are mostly perivascular. They are confluent at the dermal-epidermal interface. The infiltrates show a certain amount of pallor and this reflects the high component of histiocytes. Fig 4: The infiltrates are band-like in this area and contain a high component of histiocytes. 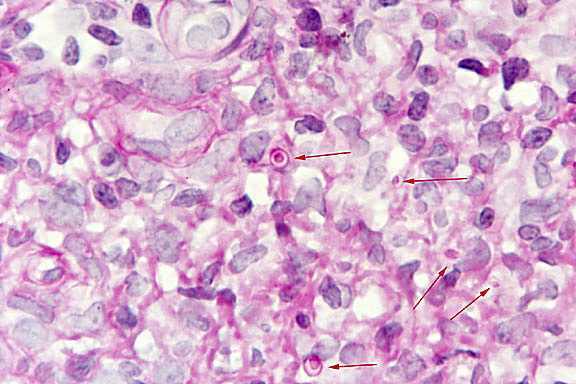 The histiocytes are mostly migratory forms with thin, elongated and wavy nuclei. The wavy, acidophilic deposits around one vessel (arrow) have fibrinoid qualities. Epithelioid clusters of activated histiocytes are not a feature. Perhaps, the poorly developed granulomatous response is a reflection of the patient’s altered immune status (HIV+). 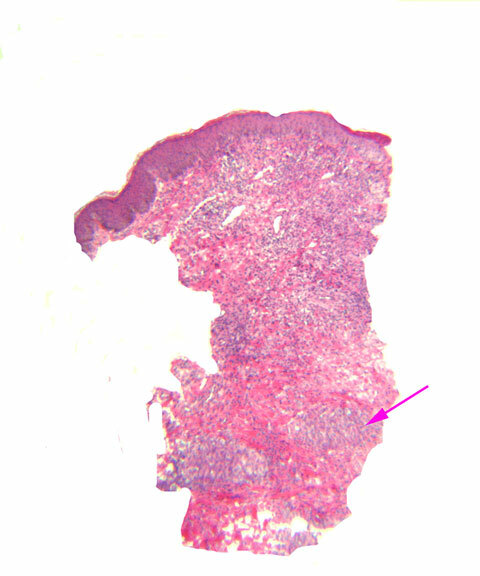 Fig 5: The histiocytic quality of the infiltrate is evident. On the other hand, the histiocytes do not form compact aggregates. There is a paucity of lymphocytes. The blue arrows identify 3 small organisms. 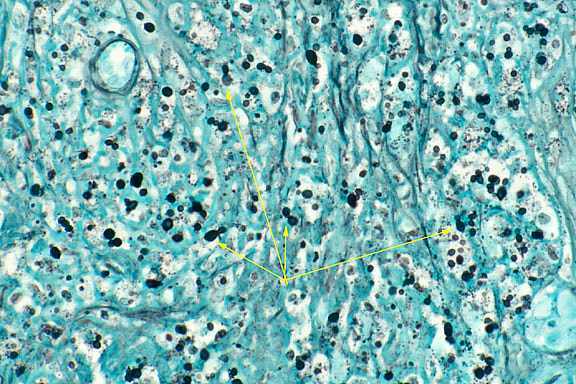 There are perivascular fibrinoid deposits (granuloma faciale-like) (pale green arrow). There are fragments of nuclear debris in the deposits of fibrin. A nerve in entrapped in the infiltrate (red arrow). Fig 6: This field is from the area of the red arrow on Fig 2. Red arrows point to several small organisms. The blue arrow identifies an unusually large organism with a doubly contoured wall. 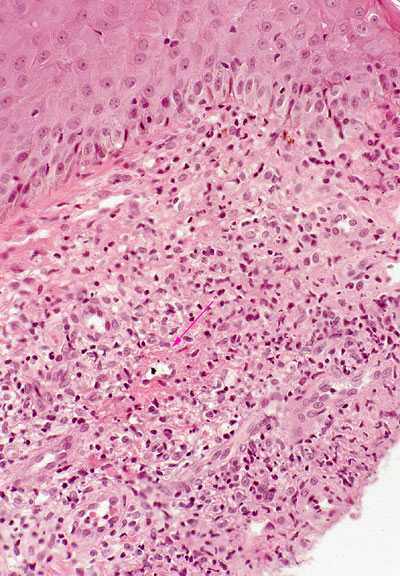 Fig 7: Area near the dermal-epidermal interface showing numerous argyrophilic organisms (Gomori stain). The arrows identify budding organisms. The buds have narrow bases. 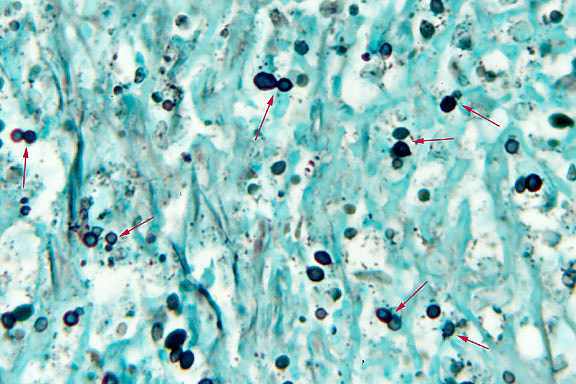 Fig 8: Several budding organisms are identified at the tips of arrows (Gomori’s silver methenamine stain). Fig 9: Organisms (arrows) varying in size (PAS stain). Some are quite small. Extra figures: Two additional photomicrographs taken with an oil immersion objective show the morphology of the organisms and the character of the budding organisms . The organisms would be easier to identify on the PAS stain if a green, rather than a hematoxylin, counterstain had been selected. 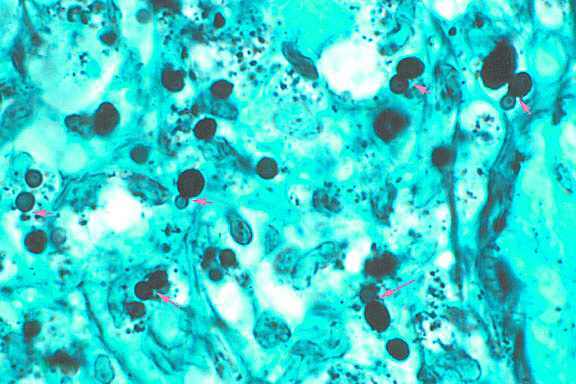 The green counterstain tends to mask the PAS positivity of connective tissue.